I am receiving lots of email from Arlington residents. The past few days Chesapeake Energy’s Fulson Drill Site (South Hwy. 360 near Sublett Rd., Arlington) seems to be on the residents’ minds. This breach in the wall is not only a violation of Arlington’s City Ordinance, it is quite dangerous because a curious child could easily slip through. Do us both a favor, Gipson, and get your people to fix this right away. Thanks. There have also been several complaints about the venting of the flowback tanks at this site. 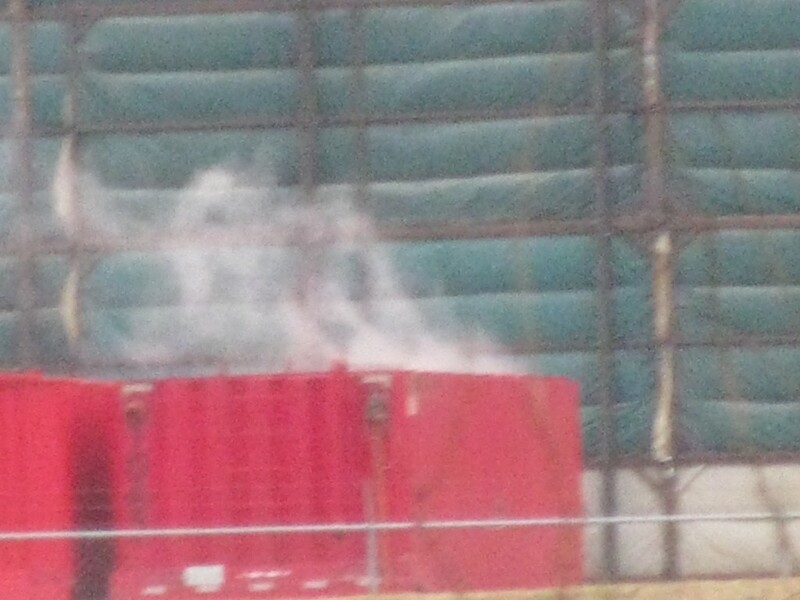 Several people noticed white vapors coming off the tanks this morning. One resident called the TCEQ but they would not do an investigation because it was was a “mobile” complaint. They can only investigate if the person making a complaint is at their residence. That doesn’t make any sense to me because noxious emissions should be reported no matter where you live but I’m sure the TCEQ had to figure out some way to cut down on the number of complaints. Another resident called 911 about the vapor but someone at the city told her it was only water vapor. Ahm, no. If it were water vapor it wouldn’t have a noxious odor and if it were water vapor they could just shut the valve. Then can’t do that because they have to vent the volatiles. The tank would probably blow up if they didn’t. The fireman who responded to the 911 call admitted he smelled a strong, pungent, chemical-type odor wafting off that padsite. Thank you Mr. Fireman! When residents make complaints and are repeatedly told by our regulators that there is nothing wrong, they begin to second guess themselves. It is great to receive confirmation, especially from a first responder. UPDATE: photos came in the email after I posted this blog. Really Chesapeake! You need to do better. You are upsetting the nativs and they are organizing. This afternoon the white vapors turned brown. EW! And maybe not last because I have quiet a few emails from Arlington residents, and not exactly least either… A crack in the wall. I took this picture this morning of an interior wall in our home. This large, horizontal crack occurred post-drilling. 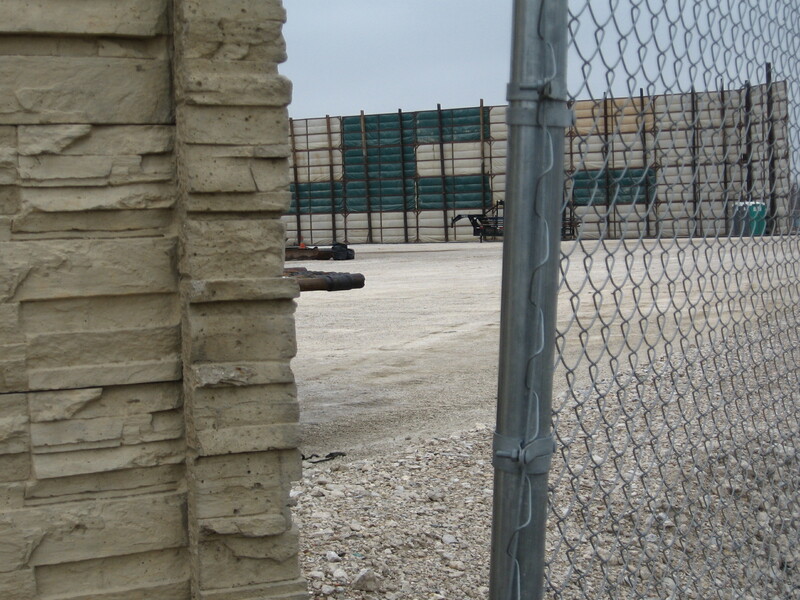 We can’t help but wonder if the industry is creating structural damage to homes and buildings throughout the Barnett Shale. Well, yes actually, I have received a number of pictures like this recently. People, take pictures of your foundation and walls regularly. Fracking actually creates seismicity. I’m not nearly through all my email yet so there is no telling what else I might find. 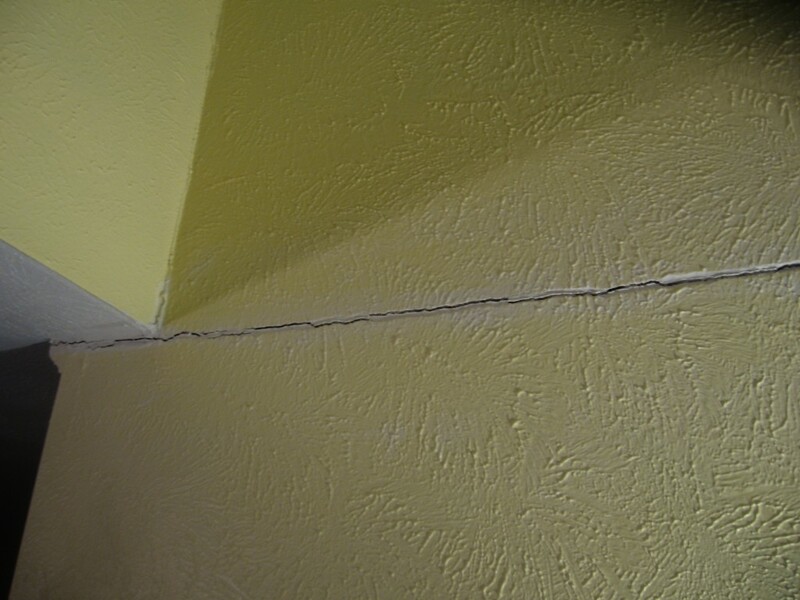 UPDATE: I just wanted to remind you of this foundation crack that appeared right after a frack job in Booger County. If the City is telling residents that it is water vapor, isn’t it plausible that Chesapeake trained them to say that? Where can that be found in the insurgency manual? Cudos to that firefighter for earning an honest day’s wage. Don’t be surprised if the City attempts to make that report disappear. In spite of the evil doings of our regulators and big gas mafia there remains a few good men amongst us. And with that hope and a prayer, perhaps Arlington can be spared from a cataclysmic event. If it is all just water vapor, how come the strong, extremely noxious and somewhat sweet smell made me dizzy, nauseated and my thoughts race in a matter of seconds? 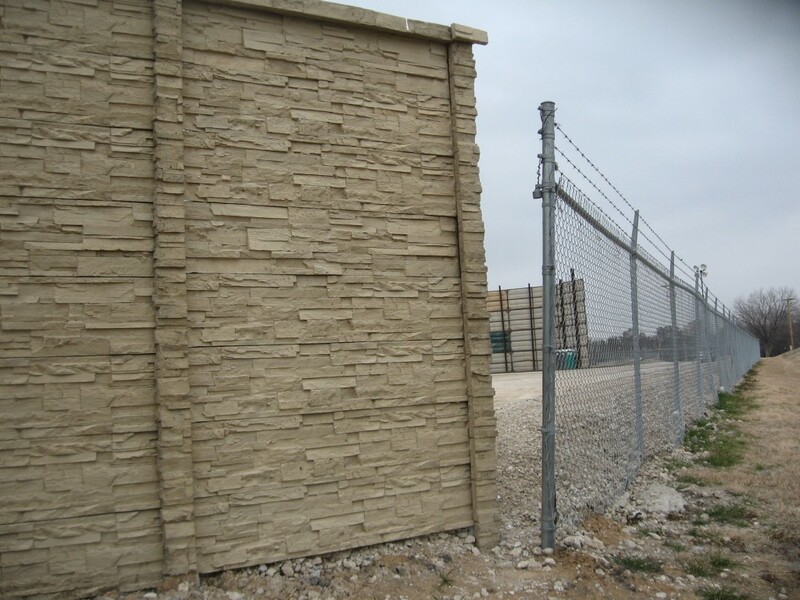 We have hundreds of drill sites around residential neighborhoods. “Water vapor” is a phrase commonly said by the RRC in Tx. for anything going to the air. If contaminants go onto the land it’s called “Landfarming”. If contaminants go to the water, it’s called “Salt Water”. Of course, any emissions of water (in any form) can include all kinds of dissolved toxins. It’s a good way to emit unquanified toxins to the air. That’s why I say, it’s all just so fracking crazy! TCEQ not taking phone call from cell phones?? well most of the people in the US have gone or are going only cellular over home phones including myself. Paid a bill for home phone for over a year and no one called it they all called our cell numbers so we have all wifi and cellular household. This is just a wrong move for TCEQ! TCEQ does take calls from cell phones. The person who called in was mobile as in not stationary at his/her place of residence. metabolize some toxicants as well as adults due to immature detoxification processes. So true! What are we doing to our children? And healthy people who exercise in it. That’s why it’s so fracking crazy! I have heard testimony from one neighbor that his teenage son began having unexplained nosebleeds after a drill site moved in 700 feet from his residence which is permitted to drill 15 wells. In addition, his son attends high school where he plays tennis that is just yards across a field from an active drill site permitted to drill approximately 20 wells. Is this purely anecdotal? No. I don’t believe so. These are real people experiencing real health impacts. I wish I had a dollar for every time I’ve heard about people who suddenly start having nosebleeds after gas wells or facilities go in near them. Please talk to your neighbor and have him start documenting this. Get a few neighbors together and I will come talk to them. Yep, it doesn’t matter if you call from a lan line or a cell phone. 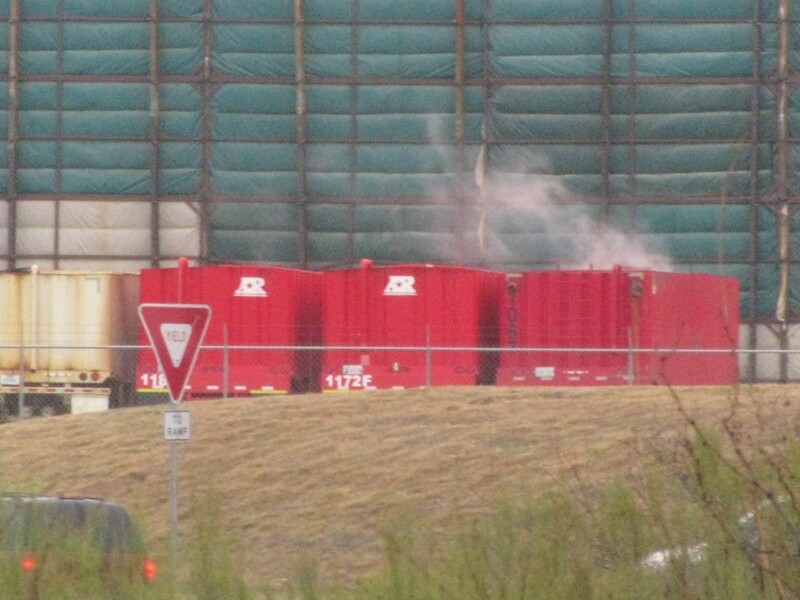 “Some” TCEQ investigators will not come out unless the odor nusiance is at a residence. If you are sitting at a red light or pumping gas and get “gassed”, they consider that a mobile incident and may not come to investigate. I called in an rotten egg like odor for a handicapped resident the other day by the Arlington Compressor Station when the Handitran passed by it and stunk out the folks. I spoke with a female rep who “was” interested in investigating that complaint, whereas this Fulson site has been having odors on the service road and at the gasoline station depending on the winds direction. Got a few more days yet to flow back…if anyone wants to go and put their health at stake, go to Sublett and 360 and take a big whiff.